Suppliers have been given a royal tour of the newly crowned Australian Bus + Coach Show venue. Mellish says attendance at the seminar and site tour shows strong support for the event and optimism about the bus industry’s future. "The NSW Government is projecting bus numbers to grow by 40 percent over the next 25 years and many of the vehicles and services to be displayed will play an important role in meeting this demand," Mellish says. "It is important that the show evolves and the move to Sydney Showground gives exhibitors and attendees a state of the art facility where all buses and booths can be displayed in the one indoor arena." BusNSW presented information on show innovations, likely setup arrangements and proposed social events during the site tour. Mellish says BusNSW also plans to introduce technology to track attendance and allow exhibitors to record visitor details. "The show provides a real opportunity for suppliers to make contact with the proprietors of bus and coach operations, as well as fleet buyers from the mining, school and community transport sectors," Mellish says. 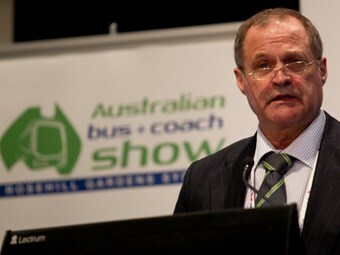 Mellish announced in October that the bus and coach show would be held at the new venue this year. Mellish says industry suppliers called for the change of venue to allow bus displays and exhibitor booths to be integrated without spreading or fragmenting displays. Australian and international bus and coach operators, government representatives, equipment and service suppliers, tourism and hospitality providers, and bus enthusiasts. The show will be held at Sydney Showground at Sydney Olympic Park on September 25-26, 2013.